Donatella - Vintage pave CZ Bridal Earrings - SALE!!! HOME / BRIDAL JEWELRY / Bridal Earrings / Donatella - Vintage pave CZ Bridal Earrings - SALE!!! 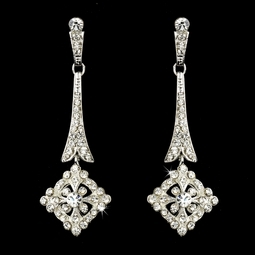 Description: Silver chandelier earrings encrusted with sparkling crystals are a lovely elegant statement on any occasion. The perfect accessory for elegant occasions or any special event.